Did you know that sharing Christmas stories has become a holiday tradition in many countries throughout the world? Many Christmas tales are fictional stories that help instill the spirit of the holiday by telling of miracles, generous acts and even magical events that inspire us, while other stories are based upon the facts of true experiences or occurrences. Some of the most famous holiday stories, like A Christmas Carol by Charles Dickens, have even been made into magnificent movies that families all over the world enjoy. When I was a very young child my mother would begin reading Christmas stories to me and my siblings soon after the Thanksgiving holiday each year, and although I don’t remember the titles of all of the holiday books she read, I do remember the wonderful feeling I always had as we snuggled up beside her on the couch and shared those special moments. When my first child was born, I vowed to maintain the tradition of reading inspiring holiday stories each year in the weeks preceding Christmas in hopes of creating treasured memories for my own children. Although there is a wide variety of Christmas shows and movies on television during the holiday season, and my family often enjoys watching them together in the weeks surrounding Christmas Day, there is just something truly special about reading from a book or sharing our own Christmas tales instead. Whether you prefer religious stories that reflect upon the details of the birth of Christ, inspiring stories that offer heartfelt messages, or humorous stories that being laughter and excitement to your story sharing experience, the memories that are created when you gather with your family members and enjoy Christmas stories together are irreplaceable. The Gift of the Magi by O. Henry is a wonderful story that features characters who are poor, elements of humor, and of course a surprise ending to create a tale that emphasizes the importance of unselfish love. 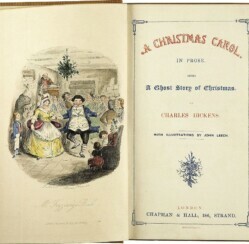 A Christmas Carol by English author Charles Dickens is perhaps one of the most famous Christmas tales of all. It has been recreated in a variety of movies and cartoons over the years, and features the stingy Ebenezer Scrooge, who goes through a magnificent transformation after encountering ghosts from Christmases past, present, and future. The Elves and the Shoemaker by the Brothers Grimm is a fairy tale from their famous collection that is known today as Grimm’s Fairy Tales. Rudolph the Red-Nosed Reindeer by Robert L. May is a delightful children’s story that has been retold through the creation of numerous books, cartoons and movies, and even a song. While all of these wonderful Christmas tales are available in print version at bookstores and some big box stores, you can also choose to download online versions and print them to enjoy with your family- many times for free. What types of Christmas stories do you and your family members enjoy reading during the holiday season? Have you ever tried to create Christmas tales of your own?